Pupils at The Weald CofE Primary School, Beare Green, are reaping the benefits after parents and staff ate their way through a remarkable 600 tubs of Flora margarine to win the school 12 Samsung Galaxy tablets. After appeals in newsletters to collect foil lids from promotional tubs, parents gathered 100 lids to earn them two tablets. But the academy school’s parent teacher association, Friends of the Weald, set its aim higher and bought 500 tubs of the sunflower spread which were sold to staff and parents at every opportunity. 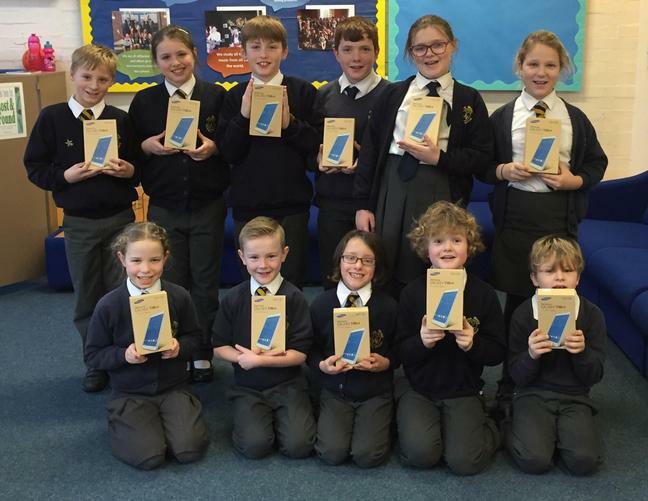 After a nervous wait – as the promotion was subject to availability – the school was delighted to receive 12 of the seven inch wifi 8GB tablets last week (Thursday, 28th January). Chair of Friends of the Weald Mrs Nicki Taylor said: “They say that you don’t get something for nothing so it is just fantastic to have this amazing package of brand new technology arrive for our children and the staff to benefit from. The school’s 277 pupils already have access to an ICT suite with computers and laptops, but the mobile devices will help with learning in classrooms around the school. Interim headteacher Mrs Karen Simpson said: “The children and staff are delighted. These are the first tablets we have had in the school so we are now eagerly looking into all the opportunities they will bring – staff and pupils will be able to use the technology to research, create and present in innovative new ways.